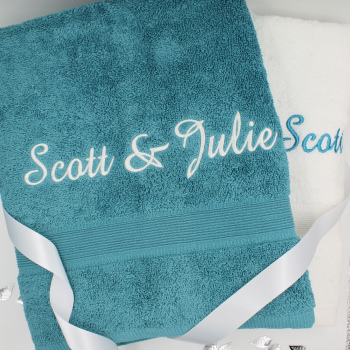 You can choose the option and have these towels made extra special -these can be personalised with your choice of embroidered text, including His and Hers, Just Married, Anniversary, His Lordship, Her Ladyship, or the couples names or initials monogrammed on each in coordinating thread. Comes with 1 stylish teal blue and 1 bright white towel very soft and very unique gift set! Please note: At Amys Gifts we do all our own embroidery work especially made to order and do our best to get most orders dispatched within 48 hours.